I submitted the following for the Letters-to-the-Editor page of a local weekly newspaper. It was not printed. Why? Well, I don’t know really, but my best guess is that I provided way too much evidence that Jesus didn’t know what the hell he was talking about, or . . . maybe the editor didn’t care for my calling religious superstition a menace. Most of my submissions do get published, but now and then, I guess I push just a little too hard. Anyway, I thought some of you might find it moderately entertaining. Did you know that the end is nigh? No, really! This time it’s for sure, according to preacher Harold Camping, President of Family Radio. Camping says Jesus will return on May 21, 2011 and the world will end five months later on October 21. Billboards paid for by supporters of Family Radio are promoting the prediction in major cities like Nashville, Louisville, St. Louis and Detroit. Now some theologians have argued that to a god, to Jesus, a thousand years might be like a day, or “soon.” However, since the bible was obviously written for the instruction of man, and no man would interpret a thousand years to be “soon,” this argument can’t be taken seriously. 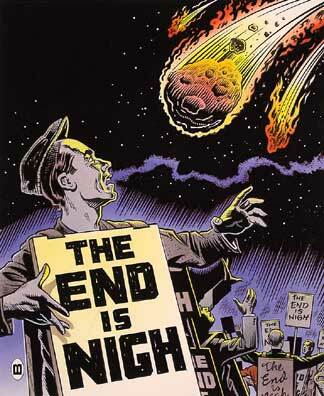 Since every one of those biblical passages cited above got it wrong, it should be obvious that the bible is not a reliable source of information concerning the end of the world. Then there is the common sense argument: if people have been repeatedly predicting the end of the world for thousands of years, and every single one of those predictions has been wrong, it makes little sense to think Harold Camping or anyone else is going to get it right. We are obviously dealing with the unknowable here. Yet, distressingly, according to a Pew Forum survey in 2006, 20% of Americans believe that Jesus will return to the earth in their lifetime. But, why not just let people believe whatever they want to believe? Why do I care? The problem is that people act on their beliefs, and those actions affect the rest of us. If a person thinks the end of the world is imminent, why would she bother to go to college, or care anything about global warming, or saving endangered species? Why polish the brass on a sinking ship? Those who believe the end is near will ignore the world’s very real problems, and may even impede the efforts of those trying to solve those problems. We all pay a price for their failure to recognize superstition for the menace it is. ExChristian.Net: The End Is Nigh!